"Guess what time it is?" I asked Lukas tonight. "Is it on?" he asked in an excited response. "Yep, it just started" I let him know. "Let's see if we can find it!" And with that, I carefully carried the contraption, which Lukas had so carefully constructed the day before, to the kitchen island and let him turn it on. It immediately crackled and let out a hiss of static through the tiny speaker. At first, I was a bit afraid that we might come across some weird, coded message, reminiscent of an episode of LOST. After all, that had happened to us before. But, with some searching and careful adjustment of the multi-functional dial, the output that we were looking for spurted out of the speaker both loud and clear. It was the unmistakably sound of a baseball game. "You did it buddy! You picked up the Mariners game." This made him smile. I was pretty excited too. In fact, there is a good chance this will prove the most exciting Seattle Mariners moment we have this Summer. But hey, it's not yet opening day and our team is tied for 1st place. So, I hold out hope. In case you haven't figured it out by now, what Lukas had built was a Transistor AM radio. 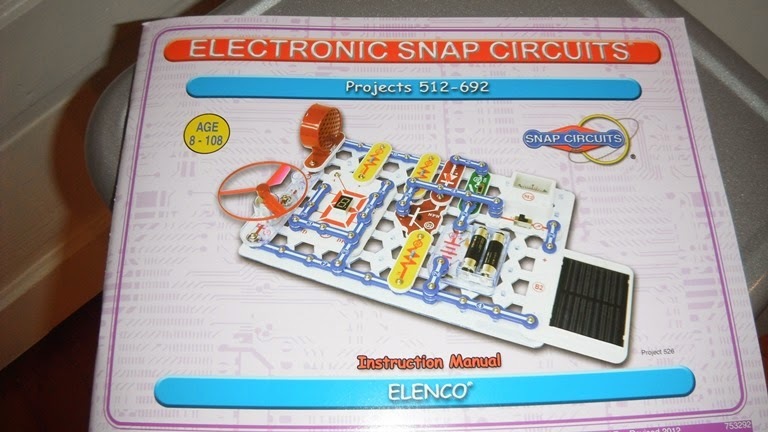 He had pulled out the Elenco Snap Circuit Kit that his grandparents had given him for his last birthday and independently decided to build the radio, because "It sounded cool." And, the only thing he was interested in listening to on his new radio was a Mariners baseball game. I think that was mostly for my benefit, but now we were getting the opportunity. And, I have to say it was the most fun I have had listening to the radio in quite some time. The novelty of it certainly factored in, but this was something my son had constructed for the both of us to enjoy. 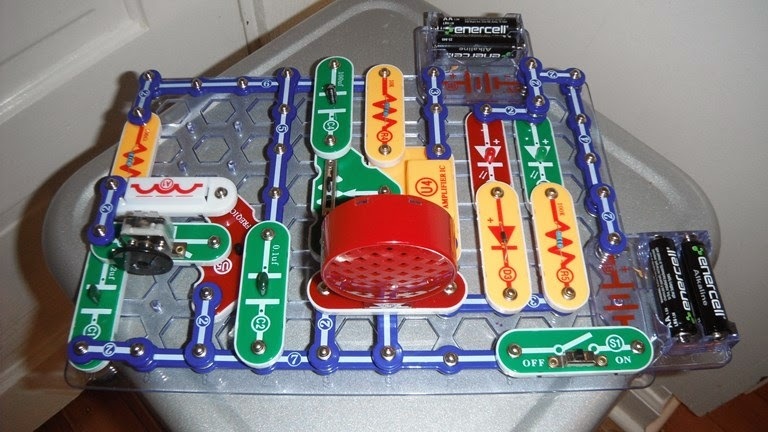 The circuit kit has made for a great gift for Lukas. He loves to tinker with different project with it. We had an inkling he would, since he has always been very adept at building things. Be it Lego's or puzzles, our son gets extremely excited whenever he gets the chance to construct something cool. This particular kit should keep him busy for quite some time too. In fact, there are quite a few projects in the deluxe kit. The radio was project #623. This obviously begs the question "How the heck did they design 622 projects before they thought of making a radio?" I'm not sure what the answer to that question is, but I'm certainly glad that someone decided to design a radio project. The manual says AGE 8-80. Lukas is 6, so I might have to talk with the folks at Elenco about revising that, but I'm sure glad that he is into these types of project at this earlier than normal age. Because, if he wasn't, we would not have had this father/son/baseball bonding moment together. Sure, it doesn't quite live up to another Mariners moment we shared together, but this one may actually be cooler because my 6 year old followed some complex instructions all on his own. And was excited to share a baseball moment with his old man. "Can you go walk with her now?" Mrs. LIAYF asked, as she handed Annabelle to me. It was more of a 'You're it' than a request really. I had already taken one turn walking with Annabelle, before giving her off to my lovely wife. Now, it was apparently my turn once again. And so, I put her down onto the restaurant floor, and like a shot she was off. She had purpose to her gait, like she knew exactly where she was going. We turned to corner, and she paused only for a moment to push on the glass door that served as the entrance to the Fish and Chips joint, before she turned and was off down the sidewalk. At nearly 17 months I can't say she was running, but she was coming as close to it as I suppose any 16 month old could. We went up the side walk nearly a half a block, climbed some stairs, slapped some walls, then it was time to head back once again. Spring has arrived here in the Pacific Northwest both on the calendar, and in the air. It was a very nice, sunny, weekend here albeit still a bit on the cold side at around 50 degrees. Mrs. LIAYF and I took advantage of the weather and an unusually long afternoon nap from Annabelle to do some much needed yard work. I say much needed because, well, because we haven't done anything out there since last Fall. 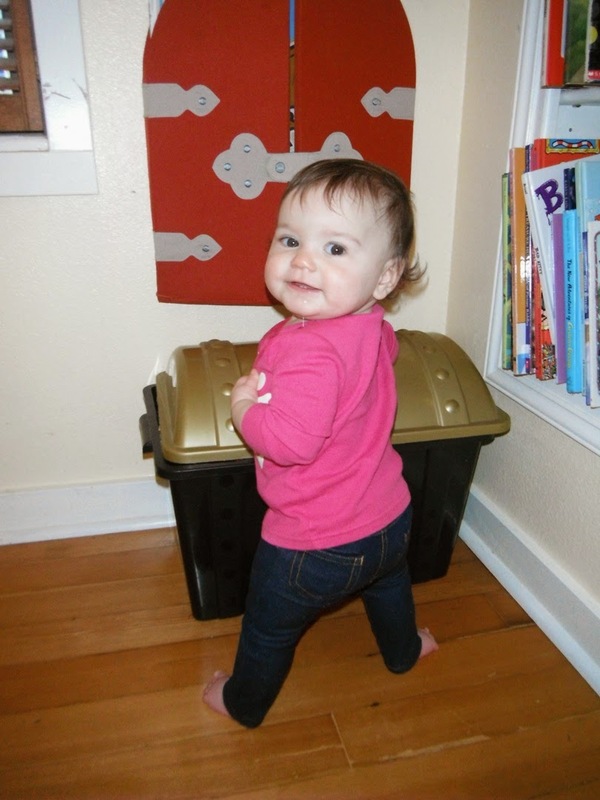 Yeah.....I think I mentioned a 16 month old. Let me rephrase that. We have a baby! (I'm going to use that excuse until she is at least two at which time I'll have to think of a new excuse). Anyway, we worked hard and got a lot of yard stuff done. Yay! We actually worked hard enough that we decided to reward ourselves by walking up to the previously mentioned Fish shop for dinner. It seemed like a good idea at the time. As I mentioned Annabelle had her own ideas. Sitting still while we dined out wasn't one of them. I shouldn't be surprised though. That's because she is a 'Go-Getter'. It doesn't matter what IT is, she is the type of baby who will go get it (And usually toss it aside quickly before moving onto the next item to go get). Seriously though, this girl rarely stops moving. Whether it be on the changing table, or sitting in a high chair for dinner, Annabelle is not content to just sit there with a smile. She HAS to be busy. Lukas was like that too, and at 6 1/2 he still hasn't slowed down, proving himself to be one of the most squirmy of a highly squirmy group of 1st grade boys. No easy feat, by any means. Now, apparently, we will have a girl version of squirmy to deal with until that mythical day far in the future when they both have 'Settled'. I'm not holding my breath. I'm sure some of you out there are saying to yourselves "All kids are squirmy though". This is not true, as too many times Mrs. LIAYF and I see children of equivalent ages to our kids quietly sitting with their parents at restaurants and events. These parents seem to be enjoying themselves too! For instance, at aforementioned Fish Shack, there was a nice looking family sitting in the both right behind us with another 16 month old girl. Did her parents have to wrestle with her to keep her still? No. Did they have to take her on several walks in the span of the 30 minutes it took to eat their Cod and Fries? NO! You know what she did do? No? She sat there quietly with a smile on her face. Eating her food. Ugh! Mrs. LIAYF looked over at this little girl at one point and deadpanned "How did we get lucky enough to have 2 kids who couldn't sit still to save their lives?" I just laughed. So did she. The truth is, as hard as it can be to have active, inquisitive kids, we know that those traits will serve them well as they grow year by year towards adulthood. These aren't kids who will sit by and watch as life happens to them, but rather will take an active role in their own fates. This is a good thing, and as much as we look at other kids calmly sitting with their families, we really love our squirmy kids to death. Life is never dull in our world. As Annabelle determinedly passed by another table in the restaurant, a kindly older gentleman smiled a big smile and looked up at me following close behind. "Wow, she's a real go getter!" he let me know. Happy Tuesday Readers. I don't do a lot of product reviews here, mainly because of time but also because of fit. Daily, I'll get offers to review items which are too large, or too small, or too hot, or too cold, or too hard, or even too comfy, believe it or not. I won't take those offers. However, every once in a while I will receive an offer which is juuuuuuuust right. And I can't pass it up. The good folks at the Radio Flyer company made me such an offer recently. They offered me the opportunity to try out their new Build a Trike service, to put together a custom tricycle for review. And since I knew a little girl who would LOVE her own new tricycle, I took them up on the offer without hesitation. And, it certainly helped that it would be a Radio Flyer! Annabelle already loves her Radio Flyer ride on car which Lukas lovingly gave her for her first birthday. And, of course, her Radio Flyer wagon which had pretty much supplanted her stroller as her preferred mode of transportation when cruising around the neighborhood. So, when the boxes arrived, Annabelle was pretty excited to help out. And couldn't wait until it was finished. Once together it was obvious that the tricycle was constructed with the same solid parts and quality workmanship we had already come to expect from Radio Flyer products. When selecting the components on the Build-a-Trike website, we were able to choose the colors, the types of tires(we opted for rubber) and a slew of accessories, including a canopy, a handy basket on back roomy enough for our diaper bag, a personalized license plate, and a speaker we can hook our iPhone up too. Yeah, I know. In fact, it seemed like the only thing we weren't able to add was a hydraulics system for the back two wheels. Oh, and a sub woofer. We weren't able to get that either. After getting her new tricycle fully assembled, and waiting the customary several days for the Seattle rain to let up, we were ready to take for Annabelle's inaugural neighborhood ride. As you can probably tell, she still has a teeeensy bit of growing to do before her feet will reach the pedals. So thankfully there is a handy push handle in back. As you can also tell, she was thrilled with her new ride. And, as expected, we received many comments from passersby who were impressed with her tricycle. Heck, It may even replace her wagon as her preferred mode of neighborhood transportation. Maybe by then I'll have added those hydraulics. Full disclosure: Red Tricycle provided us with the tricycle free of charge for my review. My opinions are not for sale though. They did not provide us with the red car, or the wagon. We bought those ourselves and are very happy with all three. Even though I have expressed it in person, I would like to take this opportunity to wish my dad a Happy 70th Birthday here publicly. His birthday was a couple of weeks ago, but I haven't posted here in a while so I have been remiss. As I mentioned in a post I'd written a few years ago, 'Catch 42', my dad and I have made a habit in the past few years of pulling out a baseball and mitts and playing a game of catch. This has been a terrific way to for us to connect, talk about the grand kids, the farm I grew up on - which he still owns and operates with my brother, and to reminisce about times past. I really love those opportunities. One thing I also mentioned in that old post was the fact that I still have my baseball glove from when I played Little League ball. 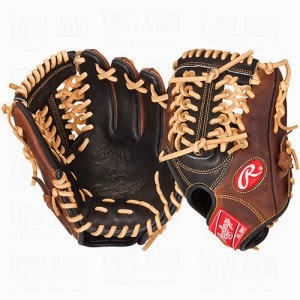 I bring that and another glove with me when we play catch together. I won that glove for selling the most candy in a team fundraiser and it's one of my most prized possessions to this day. My dad was an integral part of my selling that candy, having 'asked' a lot of vendors visiting the farm if they wanted to buy some candy from his kid. Of course they said yes. That was 34 years ago, but it seems like yesterday. Growing up on the family farm my dad was always busy, but we knew he loved us and would do terrific things for us, like making sure his son won a baseball glove. Dad is an terrific guy who, not surprisingly, is admired by everyone who knows him. And he is also a man who I admire and love dearly. So, of course, for his 70th birthday I wanted to give him a gift that meant something. As you might have guessed by now, my dad received a brand new baseball glove of his own from us for his big day. A fine piece of leather stitched together by the Rawlings Co. Along with a baseball signed by Mrs. LIAYF, myself, and the kids too. "I haven't had a glove since I was a kid!" he said as he slipped it on, smiling, and began to pound his opposite fist into its palm. You could tell that he was genuinely touched. Grandma and Grandpa are visiting this weekend. If the weather holds, I'm hoping my dad, Lukas, and I can get in a game of catch, and we can help him break in that glove. After all, Spring is coming...and we have some catching up to do.